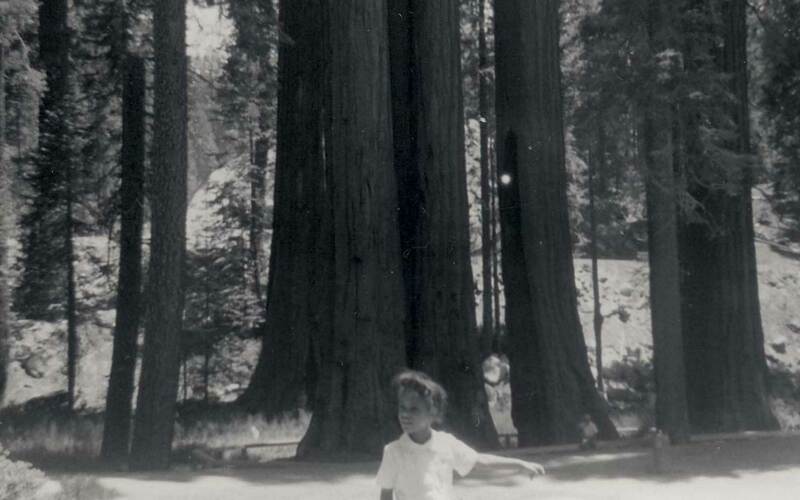 The author as a young girl in California's Sequoia National Park. A professor of environmental studies at Mount Holyoke, trustee of the National Parks Conservation Association, and author of Trace, a memoir about identity and the American landscape—Lauret Savoy grew up visiting the national parks with her family. On those trips, she realized how rarely people of color like herself were included in the official narratives of the parks. Here, she examines how far the National Park Service has come in acknowledging the more fraught aspects of its history. One lesson I learned as a small child was this: the American land did not hate. People did. This was the late 1960s, when riots ignited cities across the nation. These were years when journeys with my parents introduced me to our national parklands. Yellowstone. Grand Teton. Badlands. Sequoia and Kings Canyon. Zion. Bryce Canyon. Postcards collected by my seven-year-old self lie within reach as I write these words. Top right drawer of my desk. The edges are frayed after more than twoscore years. Most images show no people. Western parks and monuments were my refuges from what seemed to be a hate-filled world that made little sense to me. By the age of 10 I wanted to be a ranger, to wear the uniform and hat, to tell stories about this land. But I began to wonder whose stories mattered and whose “public lands” these were. Rarely did I see brown-skinned people like me. Rarely were people of color lead actors in the park narratives I heard. Custer Battlefield National Monument presented a story of the United States losing a battle but winning the war against an “Indian” other. At times I felt betrayed by the parklands I loved. In this centennial year, it is just as necessary to face the fraught history of the National Park Service as it is to celebrate its civic value. From iconic “wilderness” parks to monuments, memorials, battlefields, historical parks, and more, the making of the parks—and the elements preserved within them—are crucial pieces of this nation’s still unfolding history, pieces tied to often unspoken and unexamined narratives about what and who we are. Whose country was it? After visiting from Great Britain in 1874, the Earl of Dunraven and Mount-Earl declared Yellowstone “accessible to all who have leisure, money, and inclination to travel.” Yet touring travelers of means also encountered African-Americans—not as privileged visitors but as servants, hotel waiters, and Buffalo Soldiers whom a segregated military preferred to restrict to remote posts. Black troops of the 25th Infantry Regiment even bicycled 800 miles round-trip between the park and Fort Missoula in 1896 as part of an army experiment to determine whether cycles could be used for military purposes over mountainous terrain. 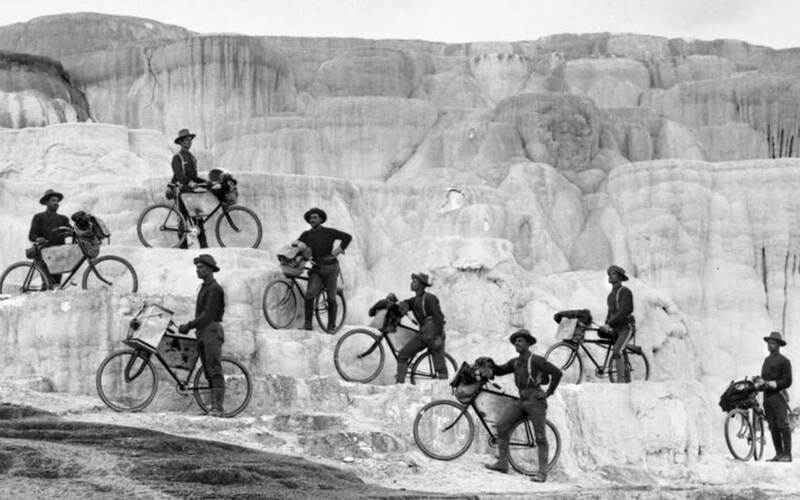 25th Infantry Bicycle Corps at Minerva Terrace, Yellowstone National Park. And indigenous peoples would be displaced again and again. The Ahwahneechee and related groups were pushed out of Yosemite Valley at various times, starting in 1851 by a California militia. In June of 1864, following three years of Civil War, President Lincoln signed the Yosemite Grant Act, giving the valley and nearby Mariposa Grove to the state of California “upon the express conditions that the premises shall be held for public use, resort, and recreation.” Bit by bit, from when Yosemite became a national park in 1890 to well within my lifetime, native residents would be forced out of the valley even as they tried to use the courts to acknowledge their land rights. Portrait of Charles Young prior to his departure for Sequoia National Park in 1903. Buffalo Soldiers were there, too, more than a century ago when the U.S. Army administered Sierra Nevada parklands. Approximately 500 African-American troops, mainly from the Ninth Cavalry and 24th Infantry regiments, patrolled Yosemite, Sequoia, and what would become Kings Canyon. 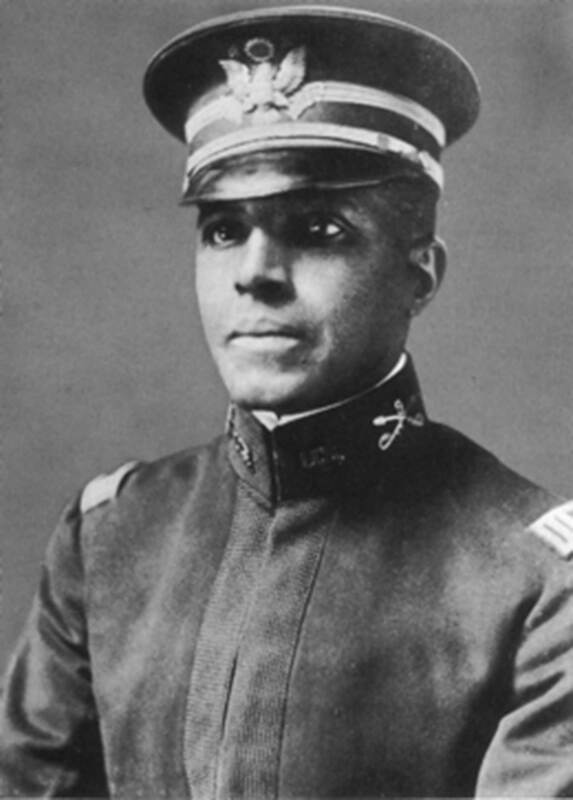 One of them, Charles Young, was the third African-American to graduate with a commission from the U.S. Military Academy at West Point. He would briefly serve as acting superintendent of Sequoia. While posted in the Sierra parks, these troops policed illegal stock grazing, timber cutting, and poaching. They fought forest fires. They built the first trail to the top of Mount Whitney. They completed a wagon road to Sequoia’s Giant Forest, giving visitors access for the first time. It is thanks to the efforts of people today like Shelton Johnson, an interpretive ranger, that these achievements have been recognized in recent years. In the past few decades, the parks have made an effort to incorporate broader contexts and more voices. Renamed in 1991, the Little Bighorn Battlefield National Monument now presents more perspectives than Custer Battlefield did when I first visited as a child. The home of abolitionist Frederick Douglass became part of the park system in 1962. The Selma to Montgomery National Historic Trail was added in 1996 to trace the momentous 1965 civil rights march. César E. Chávez National Monument was designated in 2012 to honor the leader of the farmworker movement. There are many more. 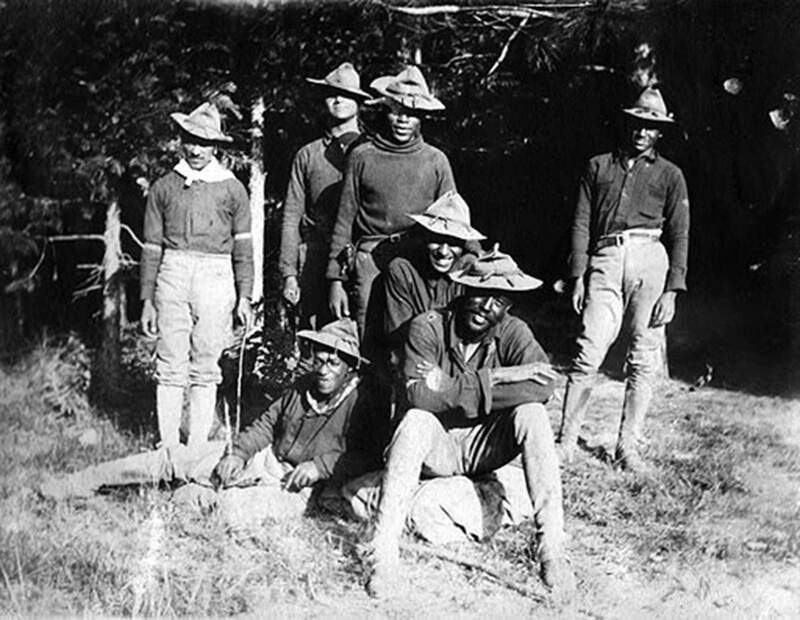 Buffalo Soldiers, Yosemite National Park, 1903.
stories of internment and earlier relocations but to remind future generations of the fragility of American civil liberties. No single narrative can ever claim authority as the American story. In this centennial year, I will acknowledge the origins of the park system. But it’s also crucial to honor the agency’s recent work and promise. More comprehensive approaches to presenting the American experience are leading visitors to think about the contexts and consequences of sometimes painful histories. And the park system as a whole offers a collective possibility to help us, the public, recognize legacies of the past that live in our present. With such lessons we might come to know each other and our place in this land a little better.